It’s that time of the year for kids to go back to school. Brighten their day with these cute, but easy to make cupcakes. 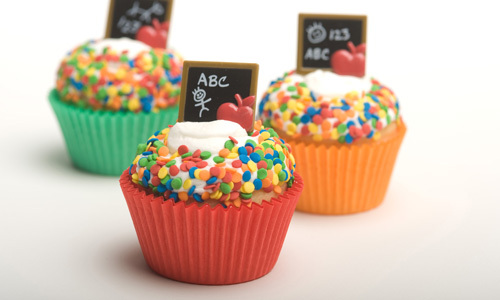 View the recipe for these School Cupcakes here! We have everything you need to make going back to school “a treat”, with our school themed cookie cutters, decor and cupcakes. Plus, this week you can save 25% off with our Back to School Sale. This entry was posted in Autumn Baking Ideas, Cupcake Recipes & Ideas, Instructions & How-To's, Recipes & Tips and tagged back to school, cupcakes, school, school cupcakes by Fancy Flours. Bookmark the permalink. good and very easy recipe for school cupcakes………..I also like very much cupcakes……….